Great fit. Good quality. Bought to replace a jacket twice its price and I'm far happier with this one. 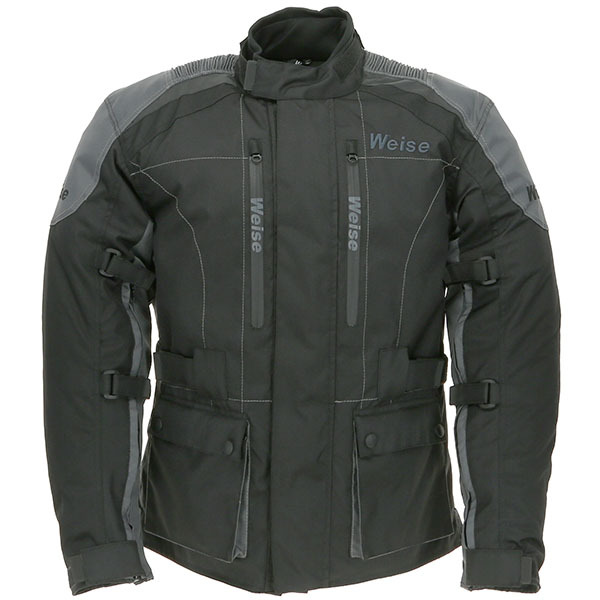 This waterproof and windproof jacket from weise is fully adjustable from the neck down. There are ventilation zips on both arms and body, along with adjustable straps on arms & waist making a precise fit to suit anyone. Great quality jacket, zips and pockets are finished to a very high standard. The colour combo looks great also, a lot better than all black in my opinion. Excellent jacket, had my previous for over 15 years and definitely made the right choice. Great pockets, i like the zips for extra movement on the arms.Good location of pockets.very warm Built in protection is good. Why spend more. Delivered the next day. I needed a jacket to be both windproof and water proof as both jan and feb have been freezing mainly. God forbid, I also wanted something protective in case of an accident and after many reviews I've made my decision on this jacket. Sportbikeshop website has so many different options that it may be sometimes overwhelming and confusing when making a choice but I've read the reviews and decide to give it a go. I'm a size L for all my clothes, I went for L and it fits perfectly, the sleeves are just the perfect length for my long arms (im 6'1). Sleeves are also zipped at the forehand/wrist part so its easy to put on with gloves on. To make it short, it does the job, it is wind and water proof. I didn't Weise but I'm very pleased with it so I bought some gloves of the same brand. Shoulder, arm and back protective pads aren't bothering but in contrary, make feel more secure once again. I defo recommend this product for entry budget/limited budget riders who are looking to stay dry and warm in this cold winter. 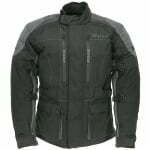 Way above me expectations, great warm jacket, very comfortable, excellent features, all this in an affordable package. Now purchased trousers too. Bought this after passing test to replace cheap Amazon jacket. So far so good in the Scottish cold and rain also removable liner and vents should do well in summer. Excellent fit for the "larger" man. Just enough pockets for phone, wallet and keys so all good. Great jacket. Very comfortable, with great adjustments on arms and at neck (which also has a soft feel, neoprene collar). Good mobility/stretch around shoulders, though quite tight at the waist (may be just me!). Expansion cuffs allow for gloves to be worn inside or outside the jacket. The full arms on the removable liner make a big difference, and the liner is very warm. Even without it the jacket is warm enough for the Autumn, with a soft feel inside, and good venting for warmer days. The only downside, also noted by others and hence why only 4 stars, are the very small pockets. Both the inner 'napoleon' pocket, and two main front pockets are very tight/too small. It's a fiddle to get a phone in them, and can't hold anything else alongside it. Firstly it came the following day. Son was very happy with the jacket, which fits like a glove. Very warm and loads of pockets which he needs, so no bad comments at all. The two front pockets are tiny. I cannot get my hands in them to remove my wallet or mobile. The rest of the jacket is very good. I have only worn it a couple of time so don't know if it's waterproof. I sent it back but they wouldn't accept it because it wasn't in original condition. I queried this but got no reply. I think the reason was, LABELS were not sent with it. Shame as I have had quite a few goods from SPORTSBIKESHOP and been happy with them. Having had this from July, just getting in to wet months, letting water in front of jacket. The fit of the jacket fine it should not say it water proof if it not, bit of a let down in the rain, OK in light rain. First jacket was damaged, no grief at all sending it back for another, very short delivery times. Excellent service. Jacket looks and fits fine, can't comment on it's performance, as I've not been out in the cold and rain yet. Very good quality, loads of pockets and winter liner. in regards to the size don't go over what you normally would wear, your size will have room to spare for a fleece or jumper underneath even with winter liner attached. for me personally neck collar is one of the best features of this jacket, you can adjust it, it's high and made out of very soft fabric nearly eliminating a need for neck warmer. Very good stitching and Velcros. Haven't tried it in a pouring rain yet, it was fine in a light rain. I honestly can't fault it so far. Sportsbikeshop service brilliant. Received click & collect in one day; carriage free. Jacket good. Bit of a high neck for me - irritates but will probably get used to it. Right lower pocket a bit small, as is internal - mobile sticks out. Test will be rain. Never had any (including very expensive) that didn't leak. Could have a little more venting but after a couple of weeks wear seems amazing for the price. My first proper biking jacket. Waterproof (apparently; I see no reason it won't be), removable liner is handy. Chest zips are vents, not pockets as I thought. Front pockets are a bit awkward but certainly work. Inside pocket just big enough to hold an iPad mini. So far very impressed and pleased I bought it. And all for £85 - bargain! I am really pleased with the jacket, its very comfortable, warm and good quality. I have been wearing it now for a number of weeks and am very happy with the jacket.